• Call or email us. Often, we can give you a quote simply based on the information you provide us. 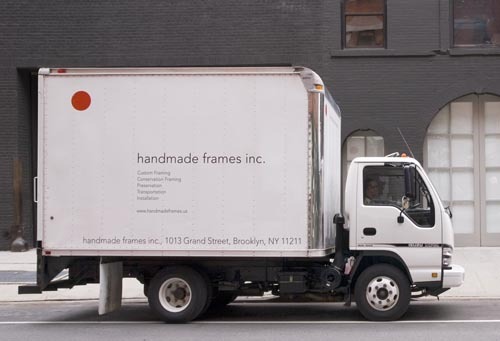 • Make an appointment by phone or email to meet at our Chelsea showroom or our Brooklyn workshop, where one of our designers will discuss your project and show you samples of frames and other mounting materials. • Arrange for us to pick up your artwork through our regular pick-up service. After we have taken a look at your work, we will call to propose some options or arrange for a face-to-face meeting. We offer regular transportation service. Every Tuesday our crew, trained in-house, makes pick-ups and deliveries. The price for this service is often included in the cost for wholesale customers and based on location for retail customers. * Call for a price and to make an appointment. *Wholes sale customers may incur a charge for extra stops or more distant pick-up locations; costs for all customers may also be affected by item size. Packing service is available. Please inquire for details.